Boko Haram fighters have attacked villages in the Far North region of Cameroon leaving at least a dozen dead, several soldiers wounded and the villages torched in a large operation involving hundreds of attackers, some of whom used villagers as human shields. Children gathered in little groups along the road shout to welcome the Cameroon military in Mabanda, a northern village on the border with Nigeria. It is one of the villages that suffered the latest Boko Haram assaults this week. 43-year old village elder Alihou Idrissu says groups of fighters infiltrated the faithful praying in Mosques and sellers and buyers on their market day Wednesday. He says one group of eight armed men invaded the Mosque while they were praying and ordered the Imam and all Muslims present to lead them to a nearby Cameroon military post. He says those who objected were killed. 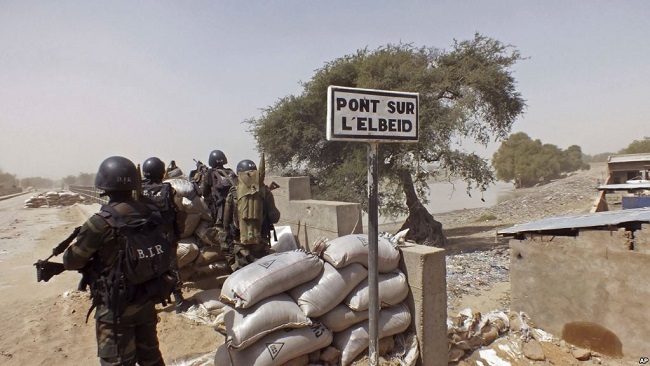 Idrissu says the militants operated for over two hours and killed at least 14 villagers whom they accused of failing to inform Boko Haram when Cameroon army arrived in their village ahead of raids on the insurgents’ strongholds in the Sambissa forest last month. Jean Pierre Ndanga, a Cameroon military officer in Mabanda says they found it extremely difficult to fight back because the invaders were using villagers as human shields. He says when he ordered his troops to get down from their military jeep and move towards hundreds of villagers they saw marching towards the Mabanda village square, they suddenly heard gunshots and immediately understood that Boko Haram fighters were using the people as shields. He says he and many of the troops were wounded as they struggled to retreat to protect the villagers. Jean Pierre was rushed to the Mabanda health center alongside dozens of injured military and villagers. Laboratory technician Dieudonne Besong says they attended to all of the wounded without discrimination. He says many villagers had their lives saved thanks to the immediate intervention of health workers. He says four seriously wounded villagers were given the same surgical treatment as wounded military men. Cameroon’s military says the militants fled to neighboring Nigeria after the attack but at least 7 of the insurgents were killed. Cameroon’s semi-arid far North region has been a target of Boko Haram suicide bombings and raids for close to nine years as the Islamist insurgency spilled over the border from Nigeria, killing at least 25,000 in the Lake Chad basin shared by Nigeria, Cameroon, Chad and Niger. The UN Refugee Agency estimates approximately 26 million people in the Lake Chad region have been affected by the Boko Haram violence, and more than 2.6 million displaced.